We have established ourselves as one of the prominent exporters of a wide range of fresh vegetables, fruits, pulses and spices. One of our range includes fresh garlic. These fresh garlics are procured directly from the farmers and are stored in a proper ventilated godowns. Our quality personnel check these garlics on the parameters of taste and freshness during the procurement and also make sure that the packaging is also being done in a proper manner. The Indian garlic is known for its pungency. We Export up to 50 mm Garlic as per buyers requirement. Garlic is considered as one of the most beneficial agro-product. The Indian breed of garlic is preferred over others specially for its taste and other benefits. 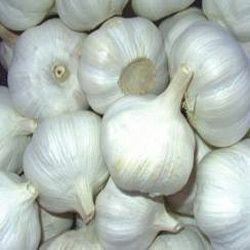 We export these Indian garlic for global consumption with guaranteed freshness. We procure these garlics directly from the farms and are specially grown and hand harvested. These garlics are free from damage, soil cuts and other infections. We check the garlics for quality and then make them suitable for trade. Further, we dehydrate and process garlics to keep the taste and nutrient content intact. The dehydrated garlics and garlic clove are peeled, cut to size or pulverize tested and then finally packed using quality packaging materials.